Walking down the aisle to a traditional wedding march is a custom that many brides look forward to on their wedding day. Whether the bride makes the journey down the aisle themselves, or escorted by her father, mother, grandfather, brother or other special person, the bridal march is an important aspect of any wedding ceremony. The wedding processional signifies the start of the wedding ceremony. 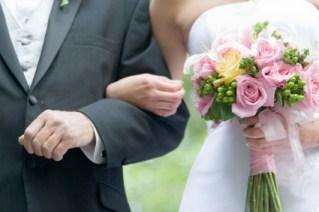 Bridesmaids, often accompanied by groomsmen, walk down the aisle before the bride. A flower girl and ring bearer may be included in the processional, too. Once everyone has reached the front of the ceremony site, the wedding guests typically rise upon hearing the bridal march song and the bride begins her walk down the aisle. The song used during the bridal march is typically different than the one played for the wedding party. Usually the song has more fanfare or is played on a different instrument, such as a violin or organ versus piano music. If you choose to use the same wedding processional music for the wedding party and the bridal march, the organist, pianist or violinist will usually pause and begin the chorus loudly and with more pomp than he or she had previously used. One of the most famous wedding march songs is aptly named Wedding March. Composed by Felix Mendelssohn, it was a part of the Shakespearean play A Midsummer's Night Dream. It became popular after being used in a royal wedding, and continues to be popular today. Another very famous march song is the Bridal Chorus, also known as Here Comes the Bride. It was composed by Richard Wagner for the opera Lohengrin. However, controversy surrounds this song. Rarely is it played in Jewish wedding ceremonies, as the composer was one of Adolf Hitler's favorites, according to Judaism 101. Additionally, some Christians object to the tune for the aforementioned reason and the fact that the song and opera do not honor Christian values. Christians often play the song Jesu, Joy of Man's Desiring by Johann Sebastian Bach. In a Catholic wedding ceremony an instrumental or soloist version of Ave Maria is commonly used as the bridal march. Classical songs are traditional songs to use in the processional. However, religious songs are also perfectly acceptable for use in the wedding processional, too. Contact the musical director at your church to find out what hymns are appropriate for wedding marches. Many churches and religious leaders have suggestions for music to use for the bridal march. If you plan to choose a song that is not on the list they provide, you may need to get it pre-approved by the officiate or religious leaders of the church if you are planning a religious wedding. Not everyone wants to play a traditional song for their wedding march. If you are planning a nontraditional, contemporary religious or non-religious ceremony, you may want to choose an alternative song. One way to create a unique march song is to have a traditional composition reworked into a contemporary version. Blending, or mashing, a contemporary song with a traditional one is also gaining in popularity. Love songs for weddings that might be used as part of the march can include songs like Unforgettable and What a Wonderful World. Songs by famous groups, like the Beatles, or contemporary adult rock, pop or country artists are also commonly played as marches. Finally, don't forget to add your favorite Broadway show tune or movie love song to the list of possibilities. The lovely songs used as traditional wedding marches will never go out of style. However, you can always consider the possibility of a nontraditional march if the conventional wedding music is not your style.